A very special evening. Two of the most important voices in British poetry and rap today, Lowkey and Anthony Anaxagorou. Hackney-based singer-songwriter Amahla completes the incredible line up. Cheap Concession Tickets – only £4.21 – students, under 26s and unemployed. 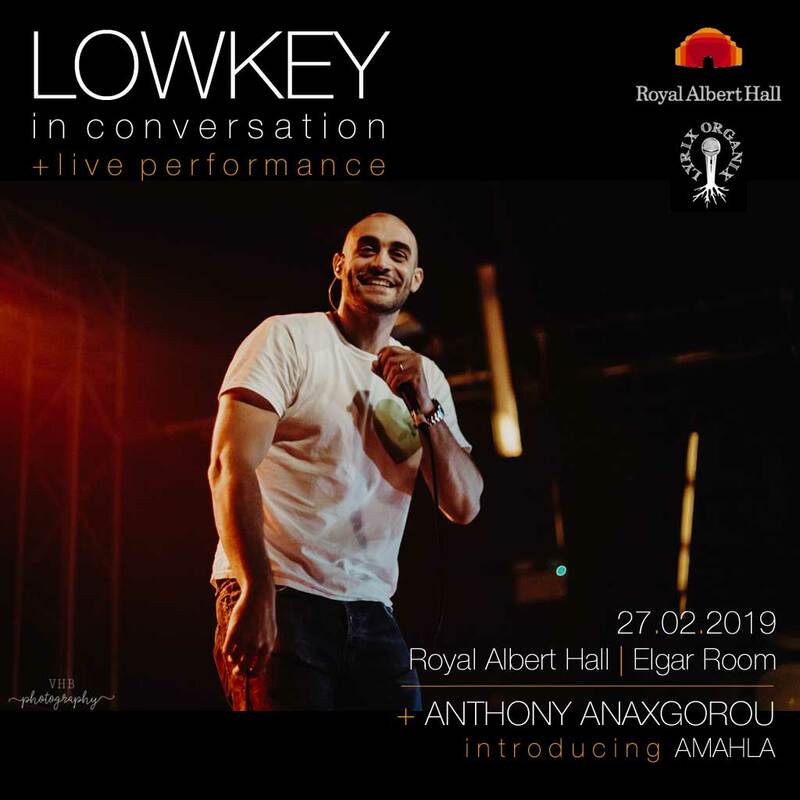 As part of Royal Albert Hall‘s Unstoppable Voices season, Lyrix Organix present an intimate evening of spoken word, hip hop and live music in the Elgar Room. As part of his performance Lowkey will also be in conversation, offering an intimate opportunity to hear about his music and activism. This show is part of Lyrix Organix’s 10 Year Anniversary celebrations. Famed for their Rum Shack stage at Glastonbury Festival (Akala, Kate Tempest, Mike Skinner, Kojey Radical), and social action work around the world, Lyrix Organix explore the space between language and music with a delicately-curated selection of UK’s most revelatory voices – featuring poets, rappers, musicians and change makers.